Twista at a Lady Gaga album release party. If Jay Z’s next song were “What the Fox Knows,” FiveThirtyEight’s lengthy manifesto, how long would it take him to rap it? Well, based on the number of words he gets through in his song “Tom Ford,” about 51 minutes. Clearly we need a faster rapper. To get a feel for the world’s fastest lyricists, we turned to Rap Genius. If that name sounds familiar to you, it’s because the Rap Genius guys revealed the inner workings of rappers’ minds through charts. 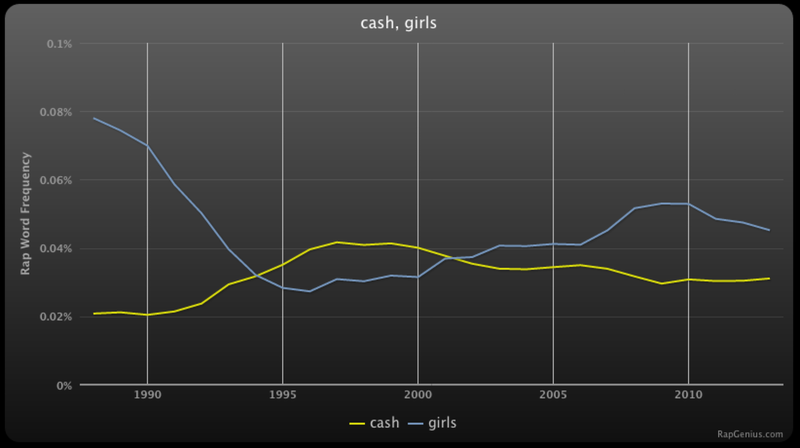 By compiling an enormous database of rap lyrics, they were able to compare rappers’ word choice over time, revealing, for example, that “cash” was more important than “girls” in the late 1990s. But here at FiveThirtyEight, it’s our job to spot axis labels. You’ll see that while the trends above may seem big, they actually represent less than 0.1 percent of all raps. That doesn’t bode well for Rap Genius research on artists’ rap speed. FiveThirtyEight is keen to develop accurate rap research, so we tested the 10 fastest rappers according to Rap Genius to see whether their rankings were justified. We looked at each rappers’ most popular song on the website (excluding ones in which the artists were merely featured) and calculated how many words they managed to utter per minute. 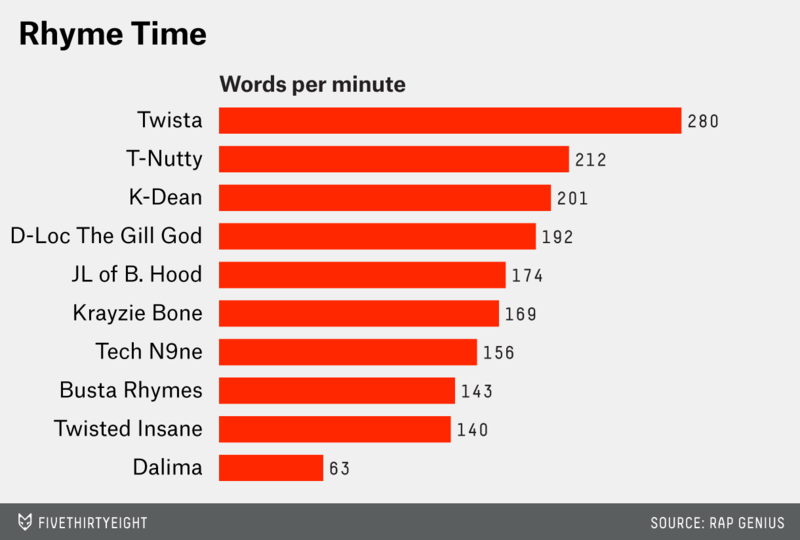 Our clear winner is Twista, who puts away 1,287 words in 4 minutes 36 seconds in the song “Mista Tung Twista.” That’s an average of 280 words per minute (wpm), or four times faster than Jay Z. And even when Twista’s not reaching those top speeds, he sounds pretty fast. Check out the video below where he manages 183.4 wpm. Our next question was whether the professionals were really the fastest in the game. We expanded our search to look at top verified users on Rap Genius. Here, “top” indicates a user has a high Rap IQ (a number based on how much he contributes to the online rap community) and “verified” means the user has uploaded at least one song of his own. With a few special exceptions (such as Nas), most of the site’s verified users are amateurs. How do they compare to the professionals? Joey Bada$$, who manages 180 wpm, is the best amateur of the bunch, followed by DyMe-A-DuZiN (179.7 wpm) and Shawn Chrystopher (174.2), but none comes close to Twista’s 280 wpm. Yo yo yo ma’ data homies, don’t let nobody fool you, you gotta check the numbers man. Correlation don’t mean causation and linear regression ain’t about time travel.